You will have a consult with our dentist at Sea Smile Dental Clinic for a dental examination, and we can then provide you the best treatment option in your particular situation. After the dental examination, we will anesthetize your tooth and the area around it for your comfort. Once your tooth is completely anesthetized, we will proceed by preparing your tooth to the ideal shape that is required for your CEREC3D restoration. Once the dental preparation is complete, we will make the digital file of your teeth with either The InEOS X5 or OMNICAM. 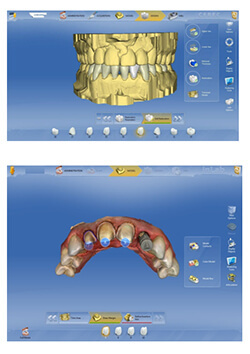 Dental software will allow us to visualize your final dental restoration and make us aware of any modification that is required before saving the image as the final image for milling purposes. The marginal accuracy is extremely high compared to the traditional hand made, pressed or casted restoration with a marginal gap of less than 0.25 microns. We will transfer the electronic STL file to either a chair-side milling dental unit or a 3D CEREC In-Lab unit, depending on the number of teeth we are working on for you. The milling unit will immediately start working on your case in a queue basis as the orders come in. Our CEREC technician will replace the dental blocks based on the selected final shade, the material and also the size of the block needed depending on the number of the teeth involved. Once the CEREC restoration is completed, we will then cement this final restoration and will check your bite for accuracy.